Have you ever thought of owning an aquarium? If yes and you thought who would go through all the hassle then here is an insiders guide to keeping fish as a pet. Now you can have a pet without hair, fur and without other problems associated with a furry friend. Imagine your room with a fish tank, watching the fish swim, how soothing and energizing you are feeling. An initial setup will cost you somewhere around Rs. 5 thousand or above with the cost of a tank, other accessories and some fish. The standard and popular tank sizes in Kathmandu are 12*15*30 cubic inches, 12*15*48 cubic inches, 12*18*48 cubic inches etc. A tank will gulp up twenty five or above liters of water as per its size. In the yesteryears, people used to build custom tanks with metal angles to support the glass but now pre-made Chinese tanks with no significant joints are also available at good prices. A Chinese tank of 12*15*24 cubic inches with some accessories will lower your balance by around 7 thousand rupees. Note that you should not place the tank in direct sunlight it will help in algae formation which will result in blurry water and need for frequent change of water. After you have a tank and water in it, the next step is to get some equipment and accessories. The floor of the tank is usually paved with stone chips and gravel. These stones cost around fifty rupees for a hundred grams. For the air supply to the fishes an air pump is must which will empty your pocket by around 5 hundred and a filter will cost around 3 hundred to 15 hundred rupees as per its functioning. You can also add natural plants, coral or artificial plants for which you’ll have to pay Rs. Twenty five to Rs 6 hundred depending on the size and the nature of the plant. A nice sea coral will cost around 6 hundred rupees. Some fancy stones and show pieces will deduct your budget by a hundred or two. Now you have a decent fish tank, its time for you to get some fishes. Fishes are generally sold in pair, a pair of fish will cost you any where from fifteen rupees a pair to 5 thousand a pair. 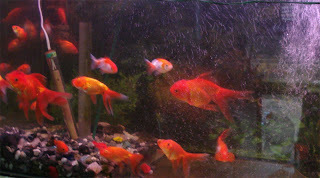 You can come across around forty spices of fishes in the aquarium fish shops of Kathmandu. Among the different types and spices of fish some popular fish species include the ever popular goldfish (Orinda, lionhead, bubble eye etc), angel fish, swordtail, molly (moontail), gourami (blue, kissing), neon, dwarf, shark, guppy etc. The cheapest pair of fish you can find will be zebra, pencil fish at fifteen to twenty rupees a pair and the most expensive pair of fish like discus, parrot fish will cost anywhere between 4 thousand to 5 thousand rupees for a pair. The no. of fishes and tank size ratio depends on type and size of fish but generally a tank of 12*15*30 cubic inches can accommodate around twenty five to thirty pairs of normal sized fish. It’s sensible that you buy small fishes and grow them. Regarding the fish food, it is advised to feed the fish twice a day once in the morning and once in the evening. There are different kinds of fish food available in the market so popular are Tokyo, Six Seven Tropical Fish food, CP with high protein etc. Fish food cost from fifty rupees and above depending upon the type and weight of the product. It is highly recommended that you don’t over feed the fish or put too much food in the tank in one go, it will make the tank dirty very fast. About the maintenance and lighting, the natural plants in the tank require lighting so adequate lighting should be maintained. Lights are placed in the lid of the tank; new tanks have custom tube lights that provide enough light. It gives immense pleasure to watch the fish swim in different colored lights as well. The recommended temperature for the fish is 26 degree Celsius to 28 degree Celsius, so in this cold season a heater with thermometer is expedient. In case fish get any kind of disease there are medicines available to cure the fish but if only one or some fishes have a disease it is better to put them in a different tank and treat them. Unusual spots on the body of the fishes or strange movements of fishes are signs that the fishes are ill. It is recommended to change 10% – 15% of the tank’s water every week, so that the clarity and hygiene of the tank is maintained. Watching an aquarium with active fishes has proven health benefits. A confirmed method for soothing stress is to stare serenely into an aquarium. The calming sound and the peaceful motion of the fish have proven to lower blood pressure and calm nerves. Dental patients have also benefited by watching fishes as they needed less pain medications. Studies have also shown that patients with Alzheimer’s experience health benefits from viewing aquarium fish. On top of it aquarium stands blend tastefully into existing décor. 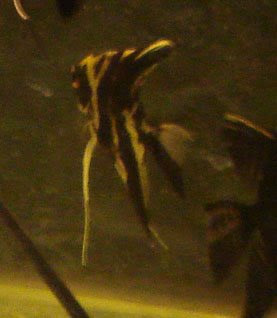 So its time, if you are thinking of getting fishes as pets go for it as the hassle you do is certainly worth it.